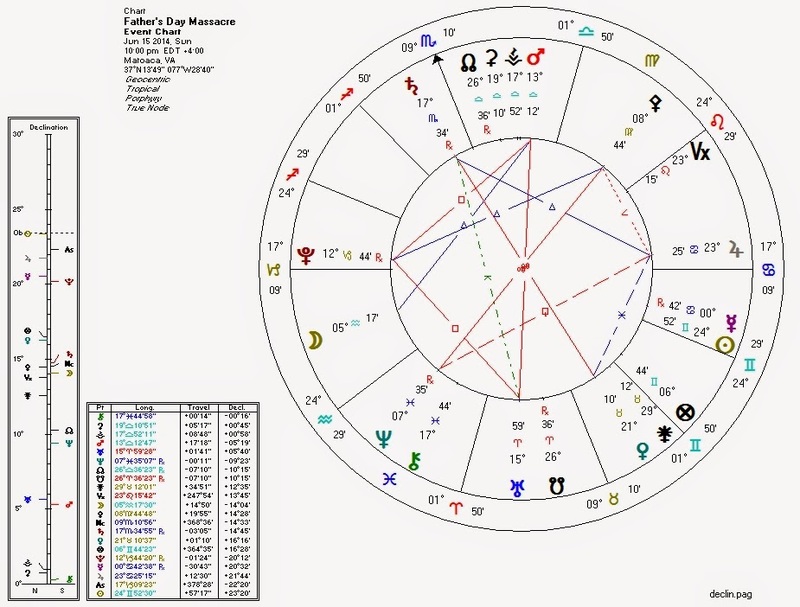 Pallas is back in a trine with Pluto, helping account for the massive violence in Iraq this past week. The Pallas-Pluto aspect also brings violence on a personal level, with a Virginia man killing his family and himself on Father's Day. Because there haven't been other reports of mass violence this weekend outside Iraq, we're looking at the event chart for the Virginia killing to hold a weak version of the Bloodbath Formula. 2. Neptune in the Second House. 3. Pluto square Uranus, co-ruler of the Second House. 4. Pluto square Uranus, co-ruler of the Moon. 5. Mercury, ruler of Sun, weakly quindecile Pluto. The Pallas-Pluto trine lasts for about another month. We will probably see a higher incidence of violence worldwide during this period (especially when the Bloodbath Formula forms), as well as authoritarian measures by governments. Pallas is the planetary ruler of the libertarian non-aggression axiom. When she is compromised by aspect, evil is afoot. June 18, 2014 at 4:06 PM http://www.infowars.com/rampaging-jihadists-kill-dozens-in-kenya/ Same day, so probably pretty much the same chart.